Three police personnel were abducted from their homes in south Kashmir’s Shopian district and shot dead by Hizbul Mujahideen and Lashkar-e-Toiba militants on Friday, the police said, as a new page opened in the three-decade chapter of militancy in Jammu and Kashmir. 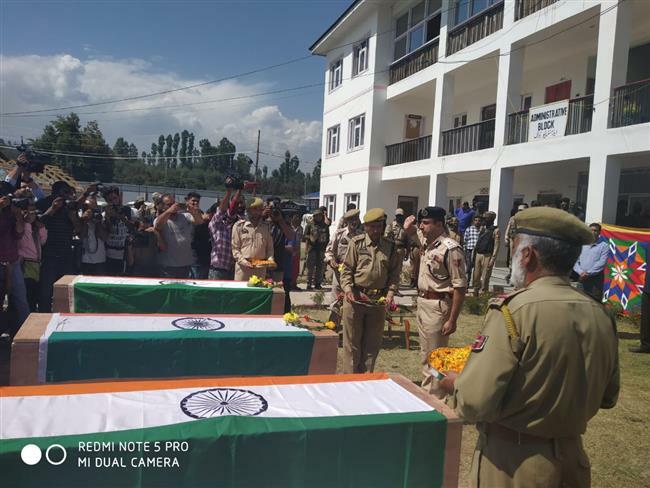 The bodies of Constable Nissar Ahmad and Special Police Officers Firdous Ahmed and Kulwant Singh were found in an orchard across a river, officials said. A video purportedly from the Hizbul had warned all Kashmiri residents working as SPOs to tender their resignations. There are over 30,000 SPOs in the state. “We have lost three of our brave colleagues in a barbaric terror strike. We will soon bring all the culprits before law,” IGP (Kashmir Range) SP Pani said. The three policemen were kidnapped in the morning from their homes at Batagund and Kapran villages, police said. The residents of Batagund chased the terrorists and pleaded with them to not abduct the men. The abductors fired shots in the air and threatened the villagers, officials said. The terrorists crossed a river in the area and shot them dead, the officials added. After the killings, at least 20 SPOs publicly announced their resignations — many via mosques and social media. Nonetheless, SPO Shabir Ahmad Thokar of Shopian, claiming to have been working with the police for eight years, declared: “Without any fear or pressure, I have resigned. I will sit at home and raise my children with dignity.” Another said he didn’t want to continue on the job as he feared for his life. “I feel threatened. My family wants me to quit,” declared yet another SPO, who has been part of the anti-militancy operations in the Valley, even as Constable Mukhtar Ahmad Lone of Hanjipora Shopian, posted with the Railways Department in Baramulla, submitted his resignation.